Beethoven, Ludwig van, 1770-1827. Quartets, strings, no. 11, op. 95, F minor (Sketches) . String quartet no. 11, op. 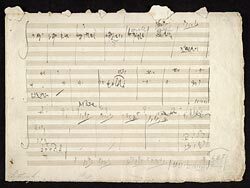 95, in F minor (sketches) : autograph manuscript, 1810.